Anthony Westhusing ('21) charges forward to the net. Luther Men’s Basketball started their 2017-18 season with a 94-64 home loss against the University of Wisconsin-La Crosse on Nov. 15. Around Two hundred spectators gathered to cheer on the men’s team. Luther’s starting roster is young, containing only two seniors. The tip-off was won by Luther forward Rahul Bagga (‘21). However, by 19:12 in the first half, La Crosse Eagles’ forward Ben Meinholz scored the first point with one of two foul shots made. Luther’s response came quickly at 18:21 when Ray Whitlock (‘20) scored two points. The first period ended with the Eagles leading the Norse, 45-31. The Eagles shot 47.4 percent the first half with 20 of their points scored in the paint. The Norse finished the first period shot 40.7 percent with 14 of their points being bench points. The Eagles led the entire first period with a strong showing which the Norse struggled to match according to Head Men’s Basketball Coach Mark Franzen. Heading into the second half, the Eagles scored first with a free throw made by junior guard Brenden Manning with 19:34 on the clock. Luther scored their first points of the second half with a two-point shot made by Whitlock. A rebound by Bagga, put Luther’s guard, Anthony Westhusing (‘21), in a position to score a three-pointer, bringing the score to 36-50. Rahul Bagga (‘21) shoots the ball with Christian Wright (‘18) looking on. 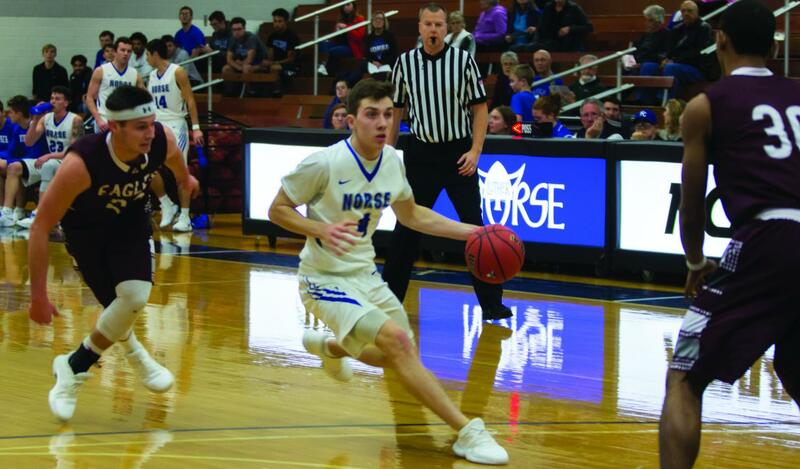 At one point the Norse closed the gap to 12 points when Luther guard Jared Nicolaisen (‘18) brought the score to 38-50. At this point, the Norse began playing the game they needed to play to compete, according to forward McCoy Matthias (‘18). Eagles forward Ben Meinholz then made a two-pointer, giving the Eagles a 14-point lead over the Norse. At the buzzer, the Eagles took the win, leading the Norse by 30 points with a score of 94-64. The second half had the Eagles shooting 56.7 percent and the Norse shooting 36.8 percent. As the team prepares for the rest of the season, the Norse have work to do, specifically with boxing out. 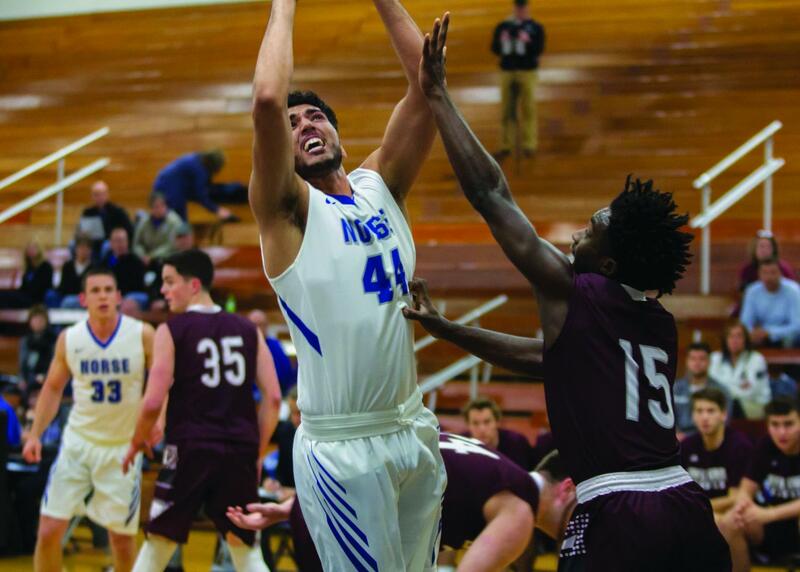 The Eagles out-rebounded the Norse 47-20, which led to more scoring opportunities for them. According to forward Christian Wright (‘18), the team worked hard in the pre-season to prepare for this game. This loss demonstrates the hard work yet to come. Spectator Morgan King (‘19) commented on the new team dynamics that influenced the atmosphere. With a game this Saturday, Dec. 2 against Loras College, the team will begin to adjust the level of competition expected for this season, according to guard Josh Peters (‘19).